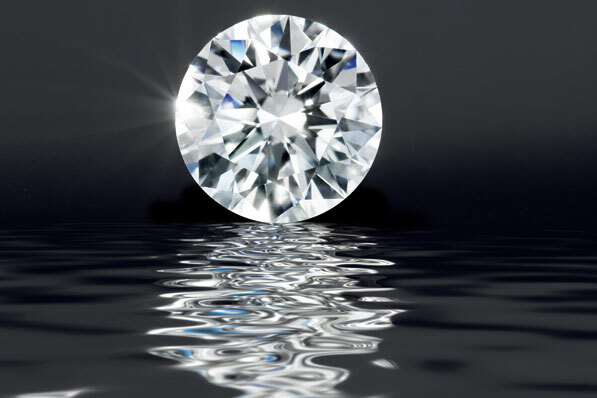 The diamond – the hardest natural substance known to man. Its brilliant fire and transparent purity was thought to endow the wearer with strength, fortitude and courage. It was the gem of the sun. The King of Gemstones. Diamonds were considered such a extraordinary and unique talisman that they were reputed to bring good fortune, spiritual ecstasy, miraculous reproductive powers – even the power to make the wearer invisible! But these special powers only worked if the stone was a gift. Diamonds were believed to have originated in a thunderbolt and therefore thunder and lightening could melt the stone! And the 14th century gemmologists were very close to the truth. Diamonds are pure carbon, crystallised by the action of heat and pressure from volcanic activity deep within Planet Earth. Carbon which does not crystallise, is a much softer material and when rubbed on paper, creates a mark. It is made into the lead in your pencil. The best diamonds are colourless, and with few or no inclusions – those small crystals,cracks or bubbles in the structure that interfere with the fire and brilliance of each individual stone. But perfect diamonds are very rare and priceless and most contain those tiny marks that characterise the origins of the stone – nature’s fingerprints. Coloured diamonds are also rare and the result of contamination by some other elements such as boron or nitrogen, combining with carbon as the mineral was formed. This creates a stunning variety of colours from purple to vivid Canary yellow – all the colours of the rainbow.